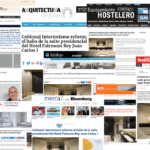 The order received by the Coblonal Interior Design consisted of renewing the bathroom of the hotel presidential suite Fairmont Rey Juan Carlos I in Barcelona, ​​in concordance with the style of the set and with the challenge of offering a qualitative leap in design and finishing. 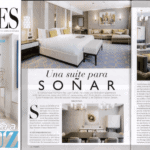 For this we were clear from the start that the combination of a functional distribution with a successful selection of materials would be the good way to develop the interior design project . We set out to avoid the usual sequence: distribution-materials, and do it together. In this sense, the choice of large-format porcelain pieces inspired by the portoro black and calacatta white marble, was crucial to fit the distribution and solve the project. These pieces, supplied by Azul Acocsa, offer great strength and versatility, especially indicated for this type of site and the beauty of natural stone. In its concept and final appearance, it is a bathroom of contrasts in harmony. Between the straight lines and the curves that draw the different profiles, between the stone and the iron that materialize it, or between the white and the black that cover the different volumes. A gala dress, with some oriental inspiration, delicately complemented by the golden elements of fittings and panels, and the silver effect of the mirrors. The result of this interior design project is a space for self-care that combines luxury and simplicity in one plane. We access the presidential bathroom through a curved and sliding door that maximizes the available space. Just enter, highlights the symmetrical confrontation of elements in the wide walls of the oval. 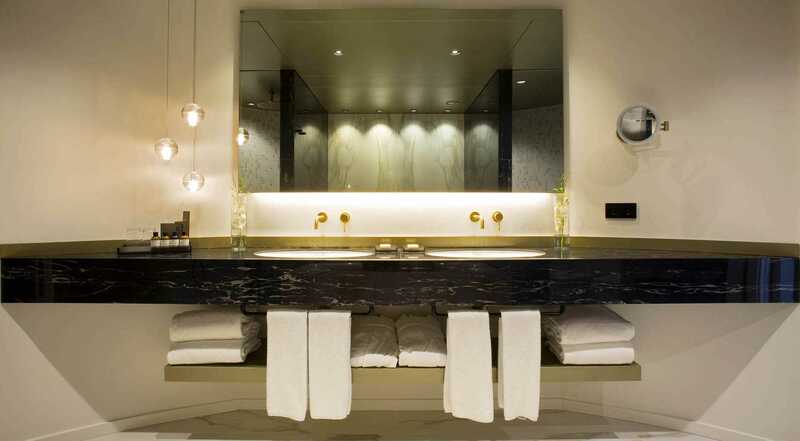 On the one hand, a large washbasin formed by a large-format porcelain envelope inspired by the black portoro marble in which are inserted two sinks of exclusive design, with golden recessed faucets Lino under an extensive mirror that has an integrated screen for play multimedia content and the brooch formed by a set of Bocci hanging spherical lamps. On the other, the bathtub is framed in the waters of the white gold calacatta that covers the illuminated volume, offering a soft and warm atmosphere and a certain suspension effect. The bathtub has another multimedia screen at your feet for the reproduction of audiovisual content while enjoying a comfortable bathroom. On both sides of the bathtub, the rest of the elements are distributed. On the side closest to the access, there is a reserved space with a sliding door that accommodates the suspended WC and bidet. On the other side, we find a large built-in shower with golden taps. It emphasizes the double relief formed by pieces of great dimensions in the inferior part and a mesh formed by small rectangular pieces arranged vertically in the part superior, both of the same porcelain inspired in the marble calacatta white gold. To ensure maximum comfort, in front of the water area, a pair of Antrax towel radiators run along as another singular piece that extols the whole. 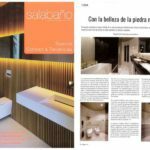 Coblonal Interior Design has been responsible for the design and construction of the bathroom and service areas of the presidential suite where we find contrasts in harmony with the maximum benefits and exclusivity.